Do you want to become an Au Pair in the Netherlands? Find important information here about visa requirements, Au Pair duties, pocket money, working hours, etc. EU and EFTA citizens do not need a visa to travel to the Netherlands. Non-EU citizens will need to apply for a residence permit, your recognised Au Pair agency will start a TEV-procedure (Entry and Residence Procedure). This procedure consists of an application for an MVV (Temporary Residence Permit) and/or a VVR (Residence Permit Regular). Residents of the following countries are not required to apply for an MVV, they only need a VVR: Australia, Canada, Japan, Monaco, New Zealand, South Korea, USA and Vatican City. Answer YES to all below questions and you can go to the Netherlands! Are you 18 to 30 years old? Are you a citizen of EU country Austria, Belgium, Bulgaria, Croatia, Cyprus, Czech Republic, Denmark, Estonia, Finland, France, Germany, Greece, Hungary, Ireland, Italy, Latvia, Lithuania, Luxembourg, Malta, Poland, Portugal, Romania, Slovakia, Slovenia, Spain, Sweden or the UK? Or EFTA country Iceland, Liechtenstein, Norway or Switzerland? Are you willing to apply for resident permit using an officially recognised au pair agency of the IND (Dutch Immigration Office). Is this the first time you will go to the Netherlands as an au pair for a cultural exchange? Au Pair Netherlands not for you? Find out more about other host countries. After you have found your family on Au Pair Legend, your host family must register with an Au Pair agency, in order to welcome you to their home. Only an officially recognised Au Pair Netherlands agency of the IND (Dutch Immigration Office) is authorised to set up an application in your name. The agency will assist both you and your host family throughout the entire duration of your stay and will provide all necessary documents and information, as well as the Au Pair contract. After your arrival in the Netherlands you will go with a host parent to the local town council to register on the GBA (Personal Records Database). For this you will need a copy of your birth certificate, passport and residence permit (if required). Au Pairs receive around 340 EURO per month. Private room and main meals will be provided for by the Host Family for free. In the Netherlands, the weekly working schedule of an Au Pair must not exceed a total of 30 hours. You may never work more than 8 hours a day or more than 5 days per week. Additional babysitting for your host family or taking on a job on the side is also not allowed. Before you start working for your host family, you should discuss how many days and evenings you will get off and when these will be. As an Aupair in the Netherlands you are entitled to a minimum of 2 weeks paid holiday per 12 months and you get do not work on public holidays. 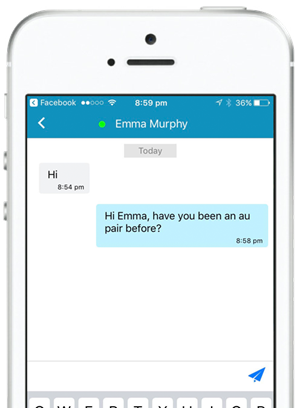 As an Au Pair you are entitled to attend a language course. Your host family will assist you in finding suitable offers within their area, and contribute 320 euros per year to your language course. It is expected that you pay for your flights to and from the Netherlands. Find a Host Family in the Netherlands now!